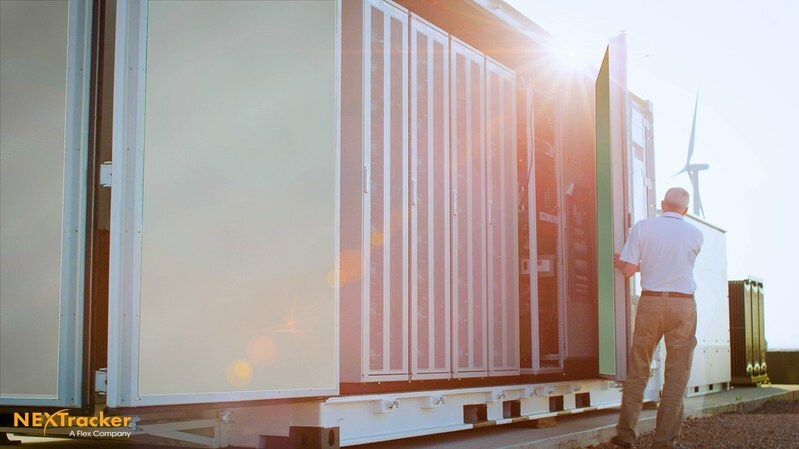 December 6, 2017 | Product News | NEXTracker, a Flex company, has announced NEXTracker Energy Storage Solutions, a portfolio of products that includes NX Drive and NX Flow. NX Drive is a standardized battery enclosure system for generation-plus-storage or stand-alone storage applications. NX Flow is a modular, integrated solution designed for long duration solar-plus-storage applications. Each is designed to maximize long-term value and offer the lowest levelized cost of storage (LCOS) for a wide variety of applications, such as peak smoothing, bulk load shifting and demand charge reduction. NEXTracker’s energy storage portfolio provides customers with configurable and intelligent solutions for new and retrofitted power plants and stand-alone applications. NX Flow’s complete storage solution (formerly known as NX Fusion Plus) integrates battery, inverter, solar tracker, and software technologies to improve return on investment for owners of solar power plants. At the core of the system lies an advanced vanadium flow battery (VFB), which is DC-coupled with the photovoltaic (PV) array for high round-trip efficiency. With NX Flow, the battery charges directly off the array, enabling the battery to capture “clipped” energy up to its storage capacity limit. Energy that has been lost to clipping can now be captured and used to generate additional kilowatt-hours revenue. Pairing NX Flow VFB technology with ground-mounted solar power offers a bankable long duration storage option for project developers and asset owners.